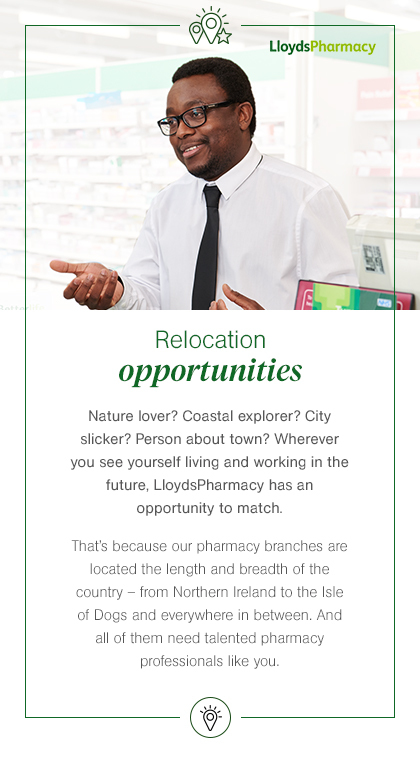 Join us in one of our selected pharmacies and you’ll enjoy a whole host of benefits and all the natural advantages of living out of town. To make sure your move is a complete success, we offer you up to £8,000 in financial support, as well as an £8,000 retention bonus. We’ll even assign you a relocation expert who can help you with everything from finding accommodation to exploring and settling into your new location. Relocation was offered to me so I took it. Until my flat was available, I spent my nights in lovely hotels like a rock star! Just like that, the pressure was off and I can get to work in minutes. I’ve had all the support I need to do my dream job and I’m proud to be a LloydsPharmacy manager. Moving can be daunting but it was the greatest move of my career, and support from the company made my transition smooth.